Apple’s expressive Messages application on the iPhone, iPad and iPod touch includes features that help you annotate image attachments with the Markup tools, touch them up with just a few taps using built-in Photos filters and browse files such as PDF or Pages docs separately of images—all without ever leaving the Messages app. 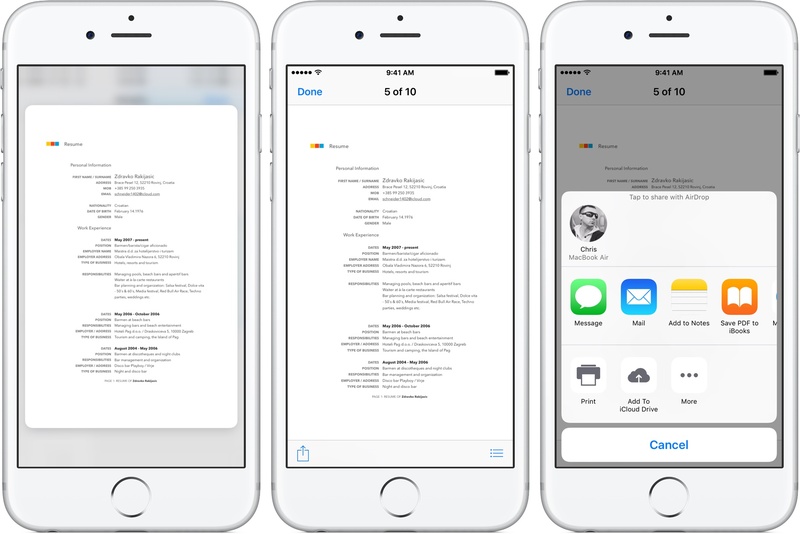 In this step by step tutorial, we’re going to teach you how you can edit, annotate and manage attachments in Messages for the iPhone, iPad and iPod touch. 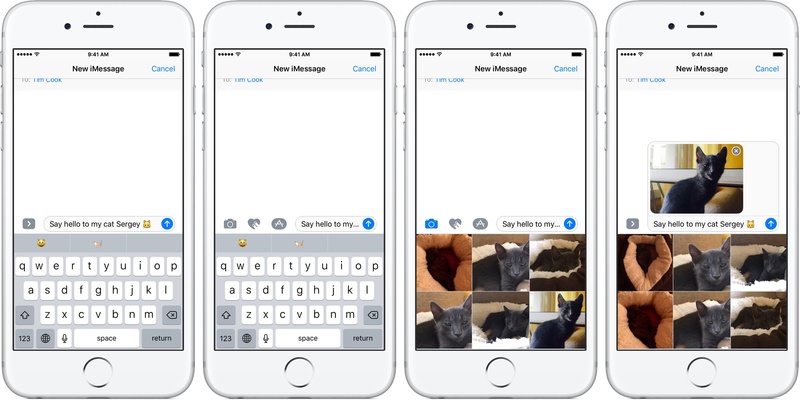 In iOS 10, annotation tools are available in both Messages and Mail with one crucial distinction: in Messages, you can only annotate photos. In Mail, you can also edit PDFs attached to emails, draw over them (for instance, to sign legal documents) and then respond with the newly marked file. 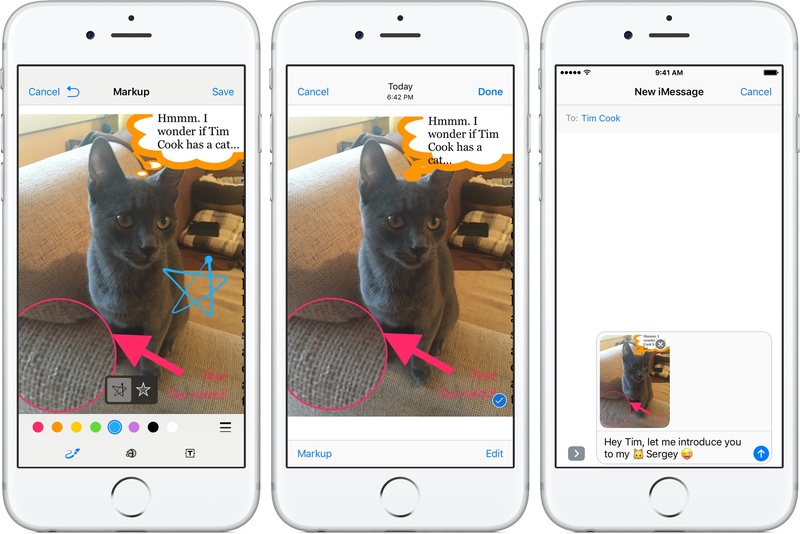 You can annotate any photo attachment you added to a Messages conversation with the built-in Markup tools. 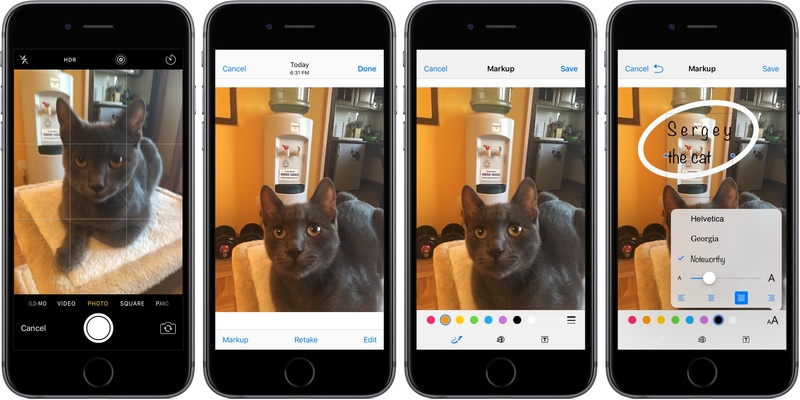 Annotating an existing photo will limit the edits to the Messages attachment without rewriting the original image in your Photos library. 1) Open Messages and tap a conversation or create a new message. 2) Attach a photo by tapping the Camera button to the left of the text entry field. 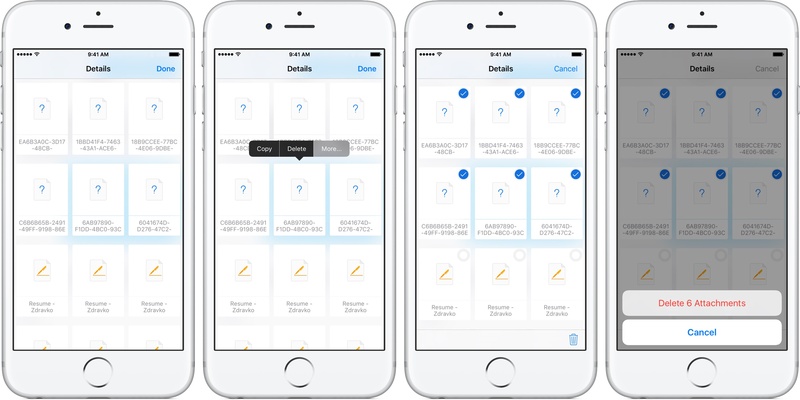 You can take an instant image (hit the shutter button on live camera preview), use the fullscreen camera interface for added punch (swipe left) or choose an existing image from your library (swipe right). 3) Now tap the attached photo in the bubble, then hit Markup on the next screen. Draw an arbitrary shape with your finger and Markup instantly analyzes it and brings up an overlay with two choices: leave it as is or turn it into the closest built-in shape. This lets you quickly jot something resembling an arrow, star, rectangle, thought bubble or some such and trust Markup to do the trick. 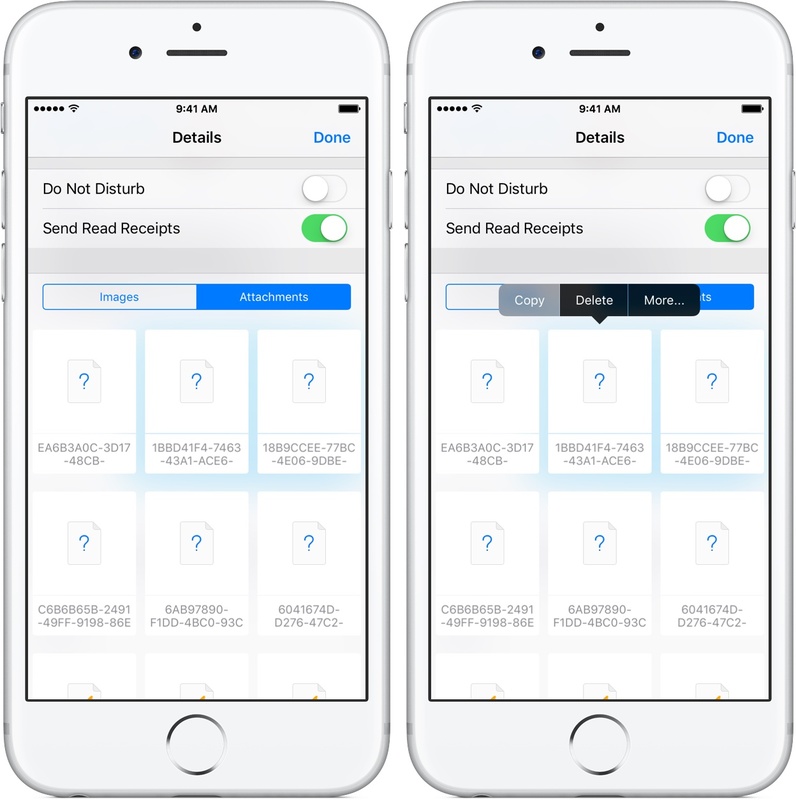 5) Tap Save to remember the edits, or Cancel to dismiss a marked up photo and return to the original attachment you added to the conversation. 6) Tap Done on the Markup preview screen to go back to the conversation. 7) Now type an optional message below the attachment and hit the Send button to shoot the message along with your marked up attachment to the recipient. You can access the Markup tools in several places throughout Messages. 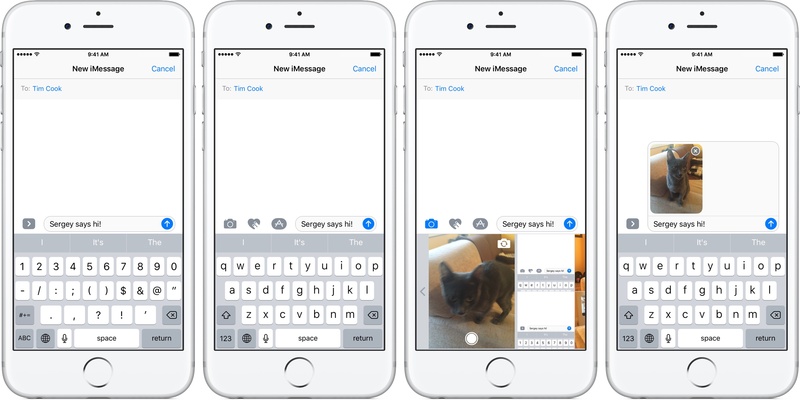 Tap the Camera button to the left of the Messages text entry field, then hit the white shutter button inside the live camera preview to instantly take a photo and attach it to your message. Photos taken with the built-in Messages camera are not saved in the Photos library. Tap the Camera button to the left of the text entry field, swipe right to reveal the Camera option and tap it to launch the stock Camera app. Now you can take advantage of the full arsenal of Camera’s tools, shooting modes and live filters. Tap the camera shutter button to take a photo, then tap Done to attach and annotate it from the chat bubble or hit Markup to start annotating right away. The original image taken in the fullscreen Camera mode is saved to your Photos library while its marked up counterpart gets attached to your message. Tap the Camera button to the left of the text entry field and swipe left to scroll through your recently taken photos, or swipe right and tap Photo Library to reveal your full Photos library and select a photo from your albums. Edits made to existing images are only applied to the attachments, not the originals in Photos. 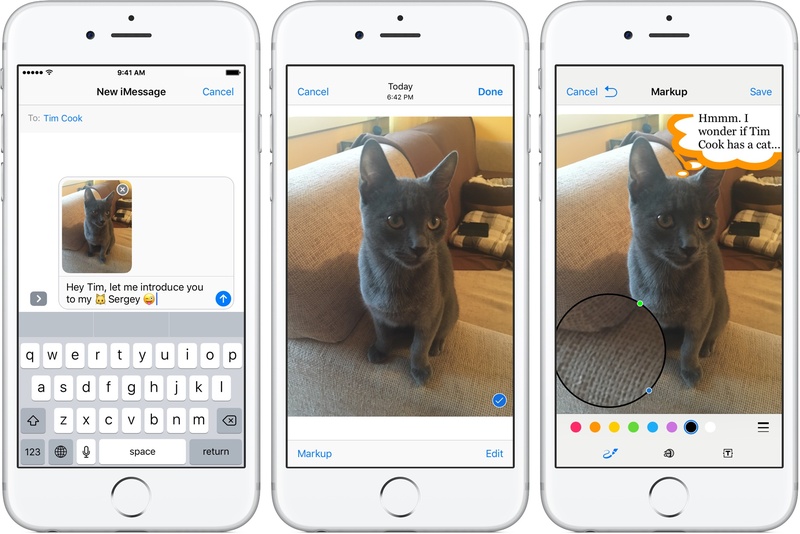 Editing a photo in Messages has a similar workflow like annotating an attachments. 2) Take an image or select an existing one to attach to the bubble. 3) Tap the attachment in the bubble, then tap Edit on the next screen. 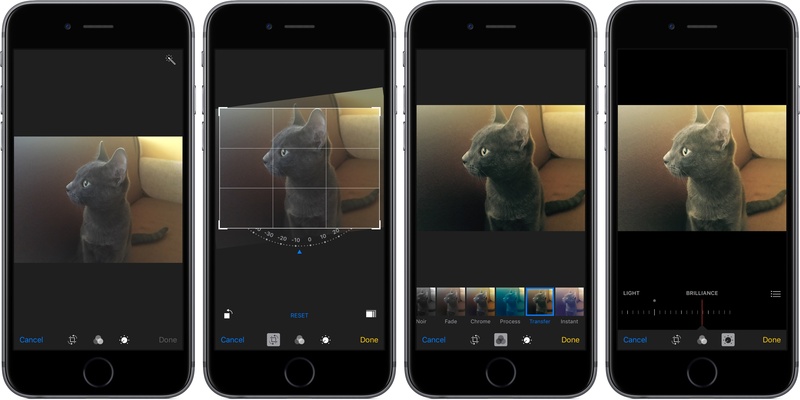 You can now use the built-in Photos tools and options to edit the attachment, like the Auto-Enhance tool, crops, zooms, rotations, filters and color adjustments. Unfortunately, third-party Photos extensions are unavailable here. 4) Tap Done to apply any touch ups to the image and exit the interface. 5) Tap Done on the next screen to return to your conversation. 6) Enter an optional message to accompany your edited image, then tap Send to shoot the attachment along with your accompanying message to the recipient. 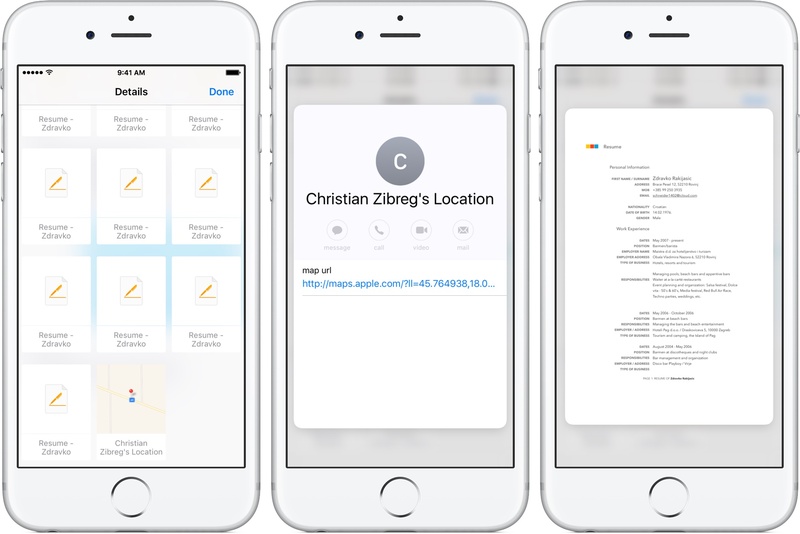 Like with the Markup tools, your edits are limited to the attachment: you can rest assured that the original image in your Photos library will be kept intact. 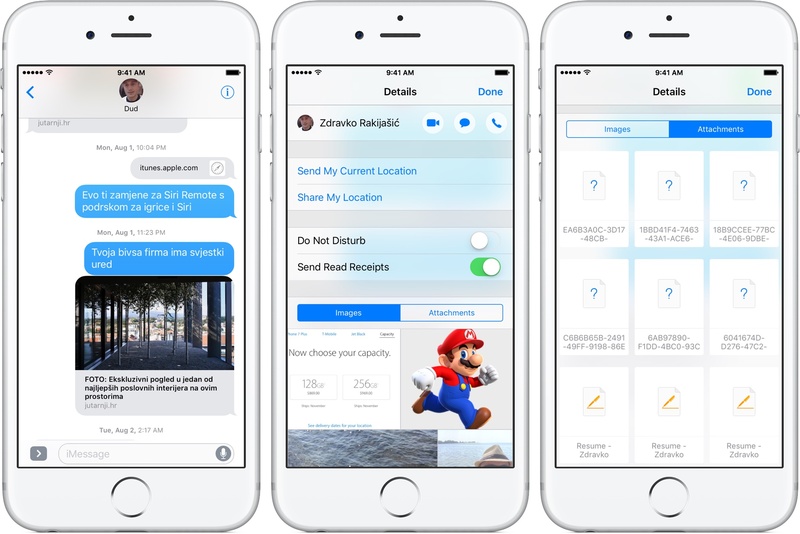 Starting with iOS 10, the Details screen in Messages permits you to edit attachments separately from the images sent and received in the conversation. 1) Open Messages and select a conversation in the list. 2) Tap “i” in the chat view to reveal the Details screen. 4) You will now see a grid-based layout of thumbnails representing any attachments you have sent to this person or received from them. You can now preview, copy and delete one or more attachments. Tap a thumbnail to preview an attachment. On devices with 3D Touch, press an attachment to peek at its contents, then press harder to display it in fullscreen mode. Use the Share menu in fullscreen preview to open the attachment in another app, print it, send it wirelessly to another device with AirDrop, save the file in iCloud Drive or share it with friends and family using Twitter, Facebook or any third-party sharing service installed on your device. While previewing the attachment in fullscreen mode, hit the Attachments button (it looks like three horizontal lines) to get to the more organized list view of any attachments you have sent and/or received in this conversation. 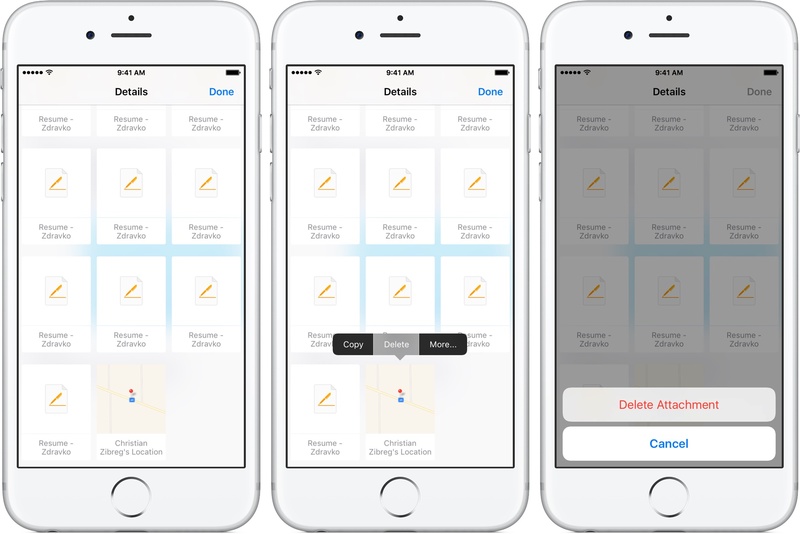 This lets you quickly select another attachment without going back to the grid view. Tap Close to exit the list view. Tap and hold a thumbnail and select Copy in the popup menu. Choose the Paste command in another app to insert the attachment you just copied. 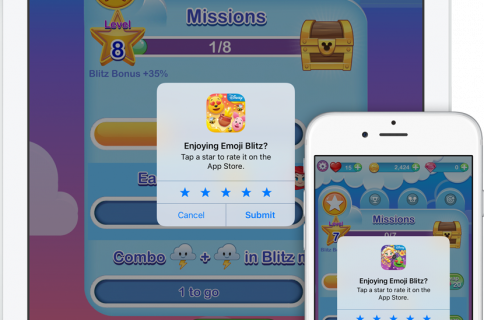 Tap and hold a thumbnail, choose Delete from the popup menu, then tap Delete Attachment to confirm the action (choose Cancel if you changed your mind). The selected attachment will be permanently deleted from Messages. Tap and hold any thumbnail until a popup menu appears, then select More and tap one or more thumbnails to select multiple attachments. Lastly, hit the Delete button (it resembles a trashcan) and confirm the action by selecting Delete [x] Attachments in the popup menu. How do you like this tutorial? Let us know what you think in the comment section below and do not hesitate to submit your tutorial suggestions at tips@iDownloadBlog.com.